Founded in 1884 and incorporated in 1916 the City of Clermont is one of the fastest growing cities in central Florida and is strategically located near major transportation networks just west of Orlando and north of theme parks. Aptly named “Choice of Champions” the City of Clermont is home or training grounds for 20 Olympians competing in the 2016 Rio Summer Olympics. As an epicenter for health, wellness and fitness, the City of Clermont has a thriving healthcare cluster with world class orthopedics, cancer treatment and robotic urologic services treating patients from across the globe. With over 14.8 square miles, of rolling hills and scenic lakeside vistas- residents and visitors to the City of Clermont enjoy the high quality and standard of life this vibrant and active community offers. A designated “Bicycle Friendly Community” by the League of American Bicyclists and a “Runners Friendly Community” by the Road Runners Club of America, the City of Clermont has attracted endurance athletes and events for over 34 years. Clermont has several prime development sites to include the downtown and waterfront areas within the 2015 adopted masterplan currently being implemented. The downtown masterplan is an innovative revitalization effort amplifying our cities best assets- people and place. The first masterplan project Victory Pointe, which began early 2016 is an innovative storm-water project reducing pad development costs, while preserving our natural asset Lake Minneola. 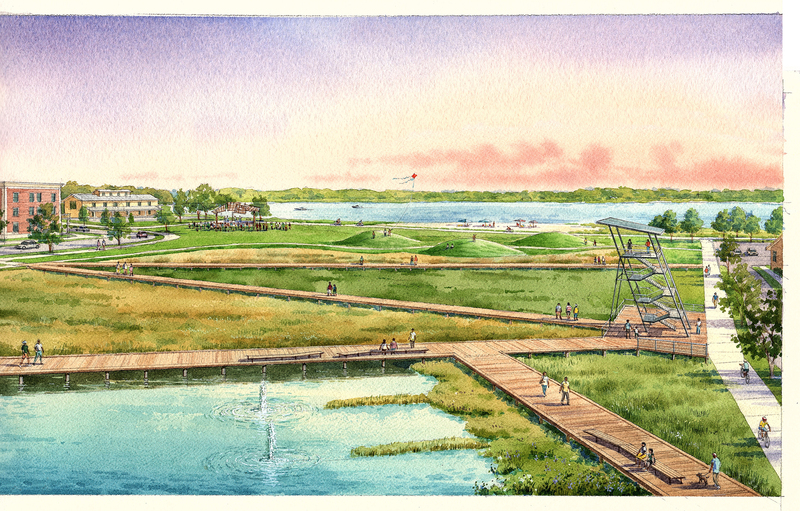 At the same time, Victory Pointe will serve as a unique open park space, which will allow for major events such as: US Rowing, 2017 Canoe and Kayak Championships and Great Floridian Triathlon deemed a “Top 10 Triathlon” by Men’s Health Magazine to take place. Victory Point will offer with unparalleled athlete and visitors experience alongside the lakeside and unimpeded access into the downtown business district. With ample sewer and water capacity, excellent transportation access with U.S. Highway 27, State Road 50 and the Florida Turnpike the City of Clermont is well regarded as a business friendly community offering quality public schools, outstanding parks and recreation facilities, beautiful golf courses, the South Lake Hospital, and the National Training Center (NTC). Air travel is accessible from two international airport facilities, Metro-Orlando Airport and Sanford-Orlando Airport, located within 45 to 60 minutes of the city. The City is also home to top rated higher education colleges and Universities-University of Central Florida, Saint Leo, Lake-Sumter State College and the Health Sciences Academy. The quality of life in and around Clermont makes it a prime destination for those looking to settle in central Florida. Local stores offer a variety of shopping and dining options along with ample sports facilities and waterfront activities. Clermont has housing choices for every income level from gated golf course communities, larger estate homes, to small and mid-sized single-family units on platted lots. As a community of families, Clermont promotes diversity, inclusiveness and civic pride. The City of Orlando is approximately 20 minutes east, professional sports teams such as the Orlando Magic (basketball) and the Orlando Solar Bears (hockey) are available to see, along with the Bob Carr Performing Arts Center for theatre. Local theatre includes Clermont Performing Art Center and Moonlight Players in downtown Clermont. The Clermont Community Center is located downtown and is available to rent through the South Lake Chamber of Commerce. If convenience, excellent transportation access, and high quality of life are important considerations for your next business, residential address or development project, come to Clermont, Florida and let us help you celebrate your success!